The solutions that we provide at Plastic Recyclers Southeast, Inc. are unique to each customer because no two customers have the exact same needs and goals. We have the experience, facility, and staff to develop simple to complex recycling and warehousing solutions. 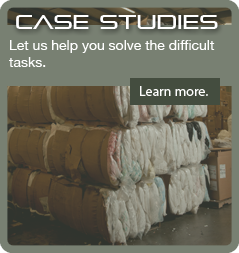 The case studies in this section of the website will help you gain a better understanding of our capabilities and the types of solutions that we have provided for other customers in the past. We can provide other specific examples upon request.